JTF (just the facts): A total of 12 photographic works, framed in black and unmatted, and hung against white walls in the single room gallery space. The 5 works from the Glass Rods series are unique diptychs, each a gelatin silver photogram (sized 11×14 or reverse) paired with a color xerox (sized roughly 9×12 or reverse). 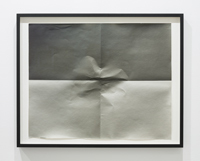 The 5 works from the Folded Paper series are unique gelatin silver prints, sized either 16×20 or 50×52. And the 2 works from the Folded Paper, Glass Rods series combine the two techniques in unique gelatin silver prints, each sized roughly 51×23. All of the works were made between 1974 and 1982. (Installation shots below. Context/Comments: One of the most exiciting things about studying the history of photography is just how changeable and unfinished it is. Surprisingly, the medium is still very much a land of current discoveries – bodies of work from known and unknown photographers alike languish in storage boxes only to be (re)discovered and (re)considered, creating new ripples of ideas and connections that link the unearthed treasures back into the broader historical timeline. This kind of inclusive scavenging happens all the time (perhaps even more now with more people searching), and given this nearly constant influx of scholarly information, the conventional wisdom about photography is constantly shifting and being rebalanced based on new evidence. It’s a fluid history, to be sure. The challenge is of course that it’s extremely hard to tease out direct causality (both up and down the line) from these isolated photographic finds. If we discover amazing photographs by photographer X, what can we assume about what he or she saw or was influenced by at the time? And who can we definitively say saw photographer X’s work and was thereby influenced by it then or later? Often, we just don’t know, and so the network diagram of artistic ideas that we desperately want to build is filled with dotted lines – we just can’t be sure about whether we are seeing overt influence, diffuse idea recycling, or simply separate but parallel invention, even if the chronology is clear. I will readily admit to being impressed by Sheila Pinkel’s work from the 1970s, having never seen or heard of it before – in the context of the discussions going on right now in 21st century contemporary photography, it couldn’t be more prescient. Her Glass Rods series starts with refracted black and white photograms that recall crisp 1930s advertising studies of machined parts, Bauhaus darkroom abstractions, and Berenice Abbott’s scientific studies of light; they feel altogether familiar (in a good way). What’s astonishing though is the second half of each of Pinkel’s diptychs. In these works, she takes her photogram, places it on the bed of a Xerox machine and makes a copy, misaligning the print during each pass of the light, creating multilayered color copies that shimmer with layered rainbow interference. Made with the cutting edge technology of the day and then purposely manipulated to create jittering optical dissonance, the images feel remarkably fresh and current some 40 years later – with obvious parallels to the recent work of Travess Smalley, Sara Cwynar (particularly her smeared darkroom manuals), or even Jessica Eaton (remember the wavy ArtNews cover?). Curators should take note – there is probably a smart show to be built pairing 1960s/1970s photocopy/Xerox art with contemporary digital glitch/scanner/cameraless photography; while the technologies have changed, both the aesthetics and the intentions are related. Pinkel’s Folded Paper images are equally forward thinking. Using a cameraless process of folded papers and directed light sources, the crumpled planes of the paper were exposed differently, creating flat two dimensional representations of the earlier three dimensionality. Her works in this series range from elegantly simple (with just a single fold or two) to violently active and undulating (the whole surface crumpled), mixing visual textures with real folds. If this confounding of image and object sounds familiar, dig into the recent work of Walead Beshty, Alyson Shotz, Karine Laval, or even Tauba Auerbach – all have been exploring paper crumpling as a visual motif. Similarly, John Houck’s investigations of layers of rephotographed folds have echoes here. Perhaps the most amazing image in this group is the largest one, where Pinkel was exploring both texture (via the lovely yellowed patina of a thick fiber based paper) and scale; for the 1970s, it’s a very large print, which says something about how she was approaching (or extending) the traditional boundaries of the medium. While it seems highly unlikely that any of the contemporary photographers mentioned above have been thinking about Pinkel’s early work directly, the rediscovery of these ideas leaves open the tantalizing possibility of more bread crumbs to follow. What/who was Pinkel interested in, looking at, and talking with at the time? Were there other 1970s era MFA students in Robert Heinecken’s UCLA program that were going in the same conceptual direction? Where did they end up? Perhaps more importantly, we may now be able to create a more robust historical context for the new work that is being created today. This small show feels like an important missing piece in the backstory of our current mindset, and it’s got me itching to pore over that seemingly fertile period, looking for additional retroactively predictive clues to where the ongoing evolution of contemporary digital experimentation might be headed. Collector’s POV: The works in this show are priced as follows. TheGlass Rods diptychs are $5000 each, the Folded Paper works are $5000 (16×20) and $15000 (50×52) each, and the Folded Paper, Glass Rodscombinations are $7000 each. Pinkel’s early work has little secondary market history, so gallery retail remains the best option for those collectors interested in following up.